Below are a few notes to familiarize yourself with Suzuka and the Japanese Grand Prix. From what tires will be used this weekend to infamous controversies, you can read about it right here. Enjoy! Pirelli will be bringing the Silver-banded Hard tire as well as its Yellow-striped Soft compound to Japan this weekend. Both tires offer pace but, more importantly, durability as car and driver tackle a mixed bag of slow to fast curves in quick succession on this circuit. Suzuka has hosted all but four of the 27 races to date. The first and second Grands Prix were held at the Fuji International Speedway, as were the 2007-2008 races. At that time, Fuji owners, Toyota, pulled out of the event and the Grand Prix was moved back to Suzuka. Michael Schumacher is by far the most successful Formula One driver at Suzuka with six Grand Prix wins. Fernando Alonso and Sebastian Vettel have also won here twice. The Japanese Grand Prix has not been particularly kind to its native sons. In 27 races, Japanese drivers have managed to score only 22 points here. Takuma Sato is Japans most consistently successful racer at this race finishing fifth in 2002, sixth in 2003 and fourth in 2004 for a total of 10 points. Currently driving for Sauber, Kamui Kobayashi snagged 6 points in 2010 for 7th place. The only podium earned by a Japanese driver was Aguri Suzuki taking 4 points for a third-place finish in 1990. F1 has had some controversial wins and losses. The Japanese GP is no different. In 1989 there was an incredible rivalry between Ayrton Senna and Alain Prost. The rivalry came to a head at Suzuka when the pair crashed at the last chicane. Prost was forced to retire from the race and Senna kept driving. He passed Alessandro Nannini for the lead and the victory. He was, however, disqualified for missing the chicane and Prost won the title. It was Nannini's only Formula One win. The feud spilled over to the following year. Senna and Prost collided again in Turn One. This accident resulted in Senna winning his second world title. 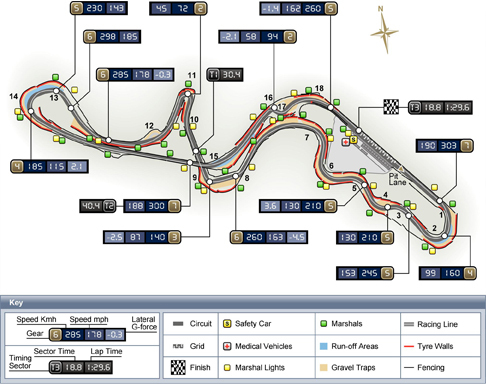 The Japanese Grand Prix airs Oct 7, 2012 1:30AM ET on SPEED.